After a glorious Wimbledon fortnights of aces, record breaking and career making, the victors and other tennis stars celebrate at the annual Wimbledon Champion’s Dinner. The preparations for this evening’s celebrations began after the men’s singles final is over as the ladies’ changing room in Centre Court was transformed into a pop-up boutique, ready for the players and their families to be styled for the night’s event. 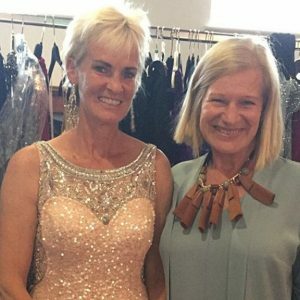 Veteran stylist Elisabeth Piner, who has been dressing the sport’s stars for 25 years, arrived armed with hundreds of designer gowns and accessories, to help a beaming Judy Murray pick out a clinging pink sequined gown to celebrate her son’s incredible achievement. 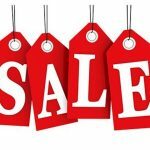 Elisabeth, who owns Having A Ball dress hire in south west London, provides the option for hundreds of designer looks to ensure the champions are looking camera-ready for the glitzy festivities. And she was also on hand with a team of four other women, including her daughters Melissa and Jenny, to help dress them. Thanks to the impromptu boutique, Heather Watson picked out a rather racy silver sequined dress with cut away sides. And Andy Murray’s grandmother Ellen popped by to borrow a fittingly celebratory burgundy dress embellished with sparkling flowers. But it’s all in a day’s work for Elisabeth, who says she has styled, ‘absolutely everyone’ from the Williams sisters to Judy Murray, also offers hair and make-up for the players. ‘It’s wonderful that I have been asked to do this job. I have dressed all the champions, everyone. It’s a challenge each year because each year it is someone different. But it is a great honour,’ she said. Elisabeth treats all her clients equally and has become an essential part of the furniture at the All England Lawn Tennis Club. 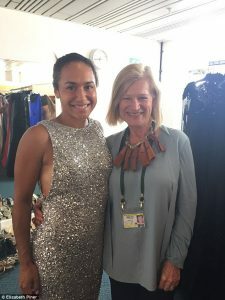 The players very rarely bring their own dresses or suits to Wimbledon, which means Elisabeth is very busy in the days leading up to the ball. ‘They want to focus on the tennis. The last thing they think of bringing is black tie dress,’ she explained. Fortunately for them, Elisabeth’s dress hire company – described by Judy Murray as an Aladdin’s cave – has options for every kind of taste. 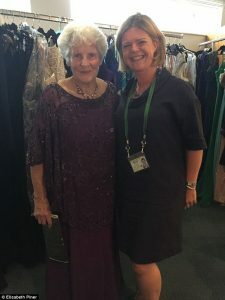 She helped Judy Murray select the glittering figure-hugging number that Judy wore to the Champion’s Dinner when Andy won in 2013. Elisabeth told the Evening Standard said that while she dressed Venus Williams when she last won Wimbledon, Serena always brings her own gown. She sets up shop on men’s final day at 8am and Elisabeth and her stylists work until 10pm. While she tends to keep her selection under wraps, in the past she has admitted to using dresses by designers including Jenny Packham and Amanda Wakeley.